Call owner Greg @ 757-685-3311. Name of the boat is Margaritaville. The total length is 33.8 Breadth is 12.2 and the depth is 6.7. The make of the boat is Silverton Marine. Boat was built in 1983. Margaritaville is currently documented with the United States Coast Guard. Its Hull type is fiberglass. It is equipped with twin 360 Chrysler inboard engines. The boat is also equipped with Brand New- Navigation/Radar/Sonar/XM radio ( speakers throughout boat)/ and a Weather model unit. It can be driven from the the second deck or from inside the boat. The boat has outriggers/and new down rigger. This boat is turn key ready. 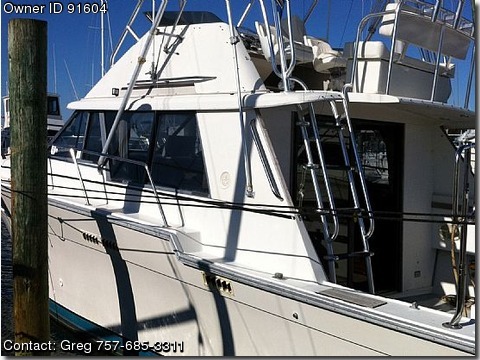 Margatitaville is ready to be taken off shore and fish for big game or anywhere out in the ocean to be enjoyed. The Engines have been rebuilt and upgraded, less then 24 total hours on the rebuilt and upgraded engines. I can give specifics upon request to much to list. The boat also has a custom fiberglass top (75 sq feet ) with overhead compartment and LED lighting. Also has new custom ladder to second deck, and new swimmer platform, and new live well/dry storage unit. Those are just some of the many extras I've added to the boat that are brand new , less then 15 hours. I have receipts for every upgrade I've put on this Boat. This boat has a shower/bathroom/sink area. It has a kitchen with sink/refrigerator/counter top/AC/heater. It also has a seating area next to the kitchen that can seat 4, and a common space with couch and table. I have completely replaced the fuel tanks with brand new ones, less then 5 months old. Just to put in perspective I have around 80 k in this thing and Im only asking 35 k.
Im in the military and Im deploying soon and need to sell it. I want some one to be able to enjoy this thing, if not its just going to sit there at the docks. Its currently located in virginia beach. Please feel free to contact me at 7576853311, or email me at avoid209@yahoo.com, or glink209@gmail.com.Thanks.